Happy new 2016 everybody, this blog is dedicated to my Stampin' Up! projects but I couldn't resist sharing one of my many home DIY projects for the end of 2015. 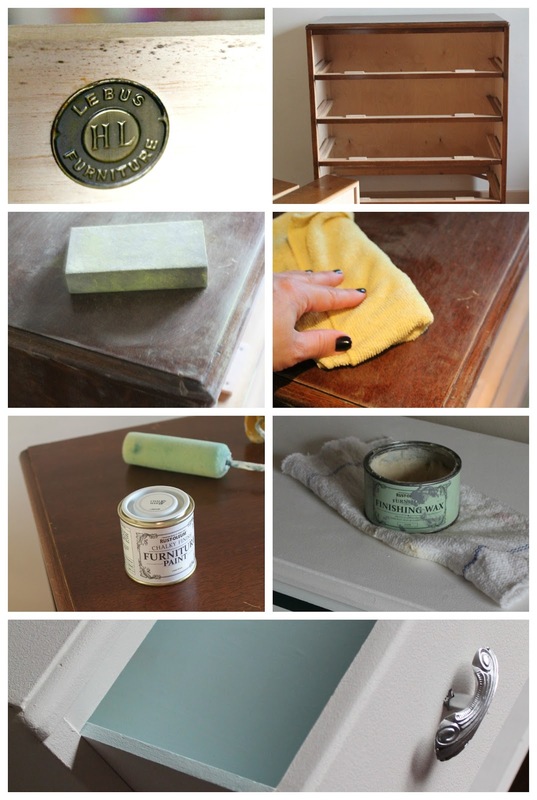 I'm re-decorating my daughter's bedroom and the chest of drawers in the picture below is part of that initiative so I thought it might be nice to share a wee review/tutorial and perhaps give you an idea about how to give new life to old furniture. I have seen many tutorials online and I have tried different kind of paints. DIY projects can have unexpected outcomes and we often fail due to the technique used or sometimes we just fail because of the materials we use so it is important to bear in mind that you can achieve different results depending on the technique and materials used. So I just wanted to share with you my experience transforming some pieces of furniture at home relatively easily with a little money and with water based Rust-Oleum furniture paints. This kind of paint is in my opinion a great solution. It is easy to clean up from brushes, hands or surfaces. It comes in small medium and 2.5 little cans and is affordable. You might not need to apply primer paint ( less work, less money, less time involved) and the darker the paint the quicker you might finish painting. When using Grey, blue or Graphite paint colours I needed less paint to finish a project (less work, less time as I only needed to apply 1 or 2 coats of paint). When applying white paint I needed to pay special attention to old paint bleeding issues. I needed extra paint as I also needed to apply at least 3 or 4 coats of paint for a good coverage. Note: My first intention was painting this chest of drawers in white and stamping the front panels of the drawers using some of my Stampin' Up! stamps + Stazon permanent ink or paint but I decided to leave it plain. I shouldn't mention this but if you like stamping on wood this might be a terrific upcycling project and instead of using stencils you can use rubber stamps to decorate the wooden panels. You can apply paint or permanent inks to stamp images on wood. I was lucky to find in a second hand shop the Harris Lebus branded chest of drawers shown in this post, in good condition, solid , the interior of the drawers were clean and it only cost me £35. 750ml Rust Oleum white chalk paint £14. The first thing I did was removing the hardware. I put it overnight in 50% water + 30% white vinegar and next day I used a sponge and a brush to remove the dirt. 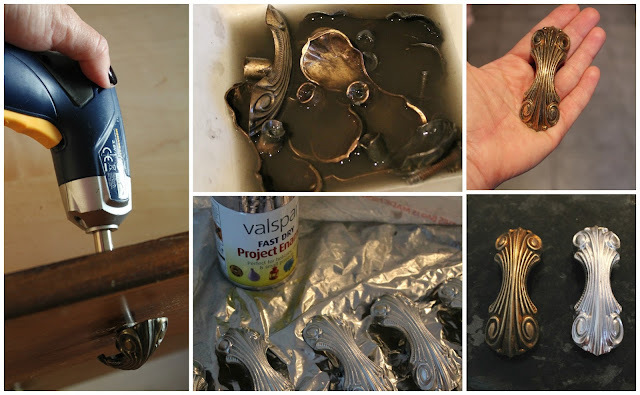 Wow, I have used vinegar to clean metals before and it works but I was wowed with the result on these metallic knobs in particular. The dirt just melted with this infusion of water/vinegar and I got sparkling antique gold drawer knobs. I could have left them like that but I applied 2 layers of metallic paint from Valspar instead. I waited 2 hours between each paint application and let them dry 24 hours before attaching them to the chest of drawers. Note: I have to admit that I thought the metallic paint was too cheap to be any good but it also surprised me as it gives a perfect coverage, nice colour and it was super easy to apply. While doing the previous procedure I removed all the drawers. 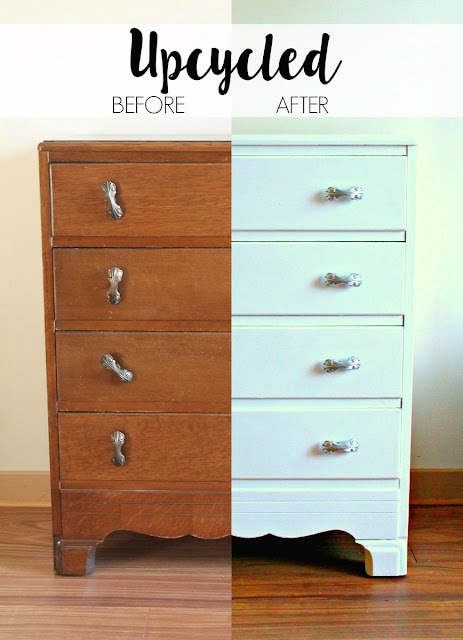 I lightly sanded the whole piece and I cleaned with a microfiber cloth and my water and vinegar formula (50% water +30% vinegar) and when dried I applied 4 coats of white paint to the outside of the chest of drawers and 3 coats of duck egg for the inside of the drawers. I used a soft brush for corners and a small roller for flat surfaces (I waited 2 hours or more between applications regardless of the instructions on the can). When I finished painting the whole piece surface (inside and outside as shown in the picture below). I applied wax but before I had left the paint to dry for 24 hours as the paint tends to change a bit when drying. To finish I did put the handles in place but changed their direction from the original design. Time spent on this project: 12 hours over 3 days. Would you like to try this? do you have any questions? please leave a comment. I'll be happy to hear from you and will answer as soon as possible. Happy new year and happy crafting!